We were recently given opportunity to review a children's book from Wisdom Tales. 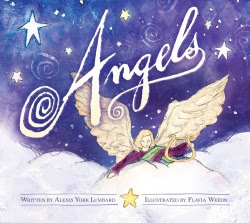 The poetic book Angels was written by Alexis York Lumbard and illustrated by Flavia Weedn. Wisdom Tales author, Alexis York Lumbard lives with her husband and three daughters in Massachusetts. Alexis's first published children's book was "The conference of The Birds" illustrated by well known author and illustrator Demi. Angels is her newest publication for Wisdom Tales, which well known artist Flavia Weedn illustrated. Alexis noticed a lack of high quality books for the very youngest of readers. In 2005, after she first became a mother she began writing her own stories. She has a B.A. in Religious Studies from George Washington University, therefore it is her sincere hope to bring the wisdom and beauty of the world's religions to the eager and gifted minds of young children. When we received this beautifully done little book, the pictures and the story was sentimental to all of us. Alexis very gently has angels every where. Not too long ago.. A very special grandmother went to heaven. During times of grief, its the children who are filled with confusion at every turn. We get left wondering how we are going to help them understand a good bye that has to be forever. We almost always have that apprehension, wanting to explain in ways so we don't traumatize the innocence of their young minds. While the book is non denominational, for our children, they are just beginning to understand Jesus is good, and Jesus is loving. Now we were faced with having to explain Jesus says its time for grandma to go home to heaven. We explain to our very little ones that Jesus has sent angels to take very special care of grandma, angels who are going to take her to her new beautiful home in heaven, and that from now on she would be like our angel watching over us all the time. The book with its beautiful pictures helped to further comfort their young minds, that angels are among us and they are making sure that grandma is okay. They love the bright pictures, and for them there is more than one special story inside.